We do not charge a transfer fee if you purchase a firearm here through our webstore and pick it up in our brick and mortar location. We charge a receiving/background check/Transfer fee of $20.00 cash ($25.00 if Credit Card is used) for standard non- NFA transfers. If your transfer has been at our location for more than 1 week we charge a storage fee of $15 a week. U.S. Defense Solutions is happy to store your firearms. Again we store for $15 per week after 1 week, charged 1 week at a time. If we receive a firearm for transfer and it is not picked up 7 days from the date we received it, it will automatically be put in storage. Firearms not picked up or without notification of intentions to pick up can be considered abandoned after 30 days without contact. Abandoned firearms will be sold to cover owed fees when the amount owed is greater than 51% of the dealer price or the lowest offered price of the firearm. It is not our responsibility to notify you of the sale of abandoned firearms or the transfer itself when it shows up at our location, although we will do our best to reach out long before this happens. 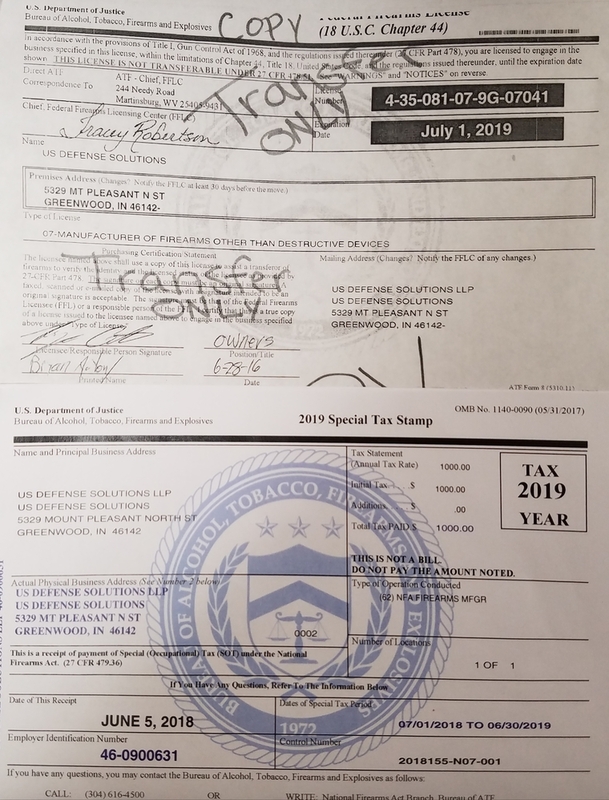 All NFA transfers will be charged a fee of $75.00 for any Machine Gun, Suppressor/Silencer, AOW (Any Other Weapon), Destructive Device, and Short Barreled Rifle. This fee is charged every 6 months that the transfer sits at our location without a form 4 submitted. Here is a copy of our FFL and SOT. You are welcome to forward this copy to the place where you purchased your firearm so they will send your transfer to us. No need to notify us of it coming to our store, we will try to contact you when it arrives assuming they put your info in the box. If they did not put your info in the box please watch your tracking info for arrival. We can not guarantee that we will contact you when your item arrives.